Evey Christmas I put up a tree all of my own. This tradition all started when my children were wee little ones. Every Christmas we chop down our tree, and make a big event out of it. My children loved to trim the tree! Which meant, when our children were young, that only the bottom third of our family tree was decorated with the most ornaments because my children wern’t tall enough to reach any higher. Oh, our family tree is absolutely my favorite. It has all the nursery school, glue and glitter encrusted ornaments and cherished treasures from my children’s childhood. 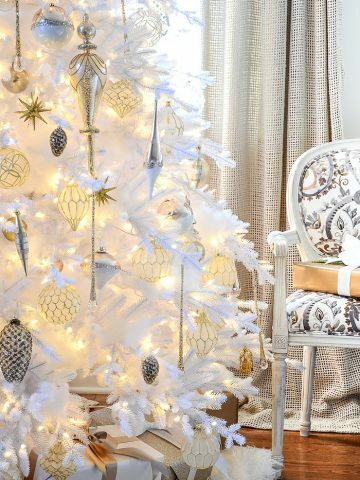 But there is a spot in my heart that longed for a creative outlet for the zillions of ideas that I had for decorating a Christmas tree. It was my husband that suggested that I get a tree and decorate it for myself. He bought me a beautiful (fake) tree, so for the last 20 years I have decorated a grown-up tree. This year we got a new tree, our old tree was looking mighty tired. A beautiful nine foot tree. It is really very life-like. It just about touches our ceiling! I put the tree in the foyer. It stands solitary and dressed up for guests. I like it here because it is a little unexpected and makes a Christmas statement the minute someone steps inside. 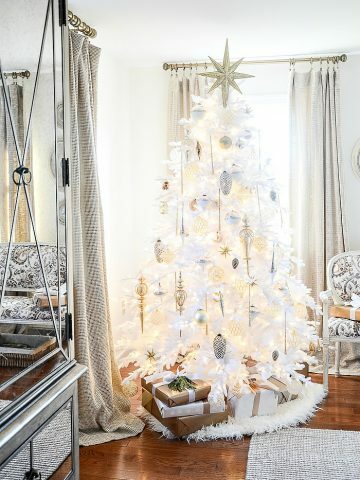 For years past I used tulle and hydrangeas and crystal in my tree, but this year I wanted a little different look. 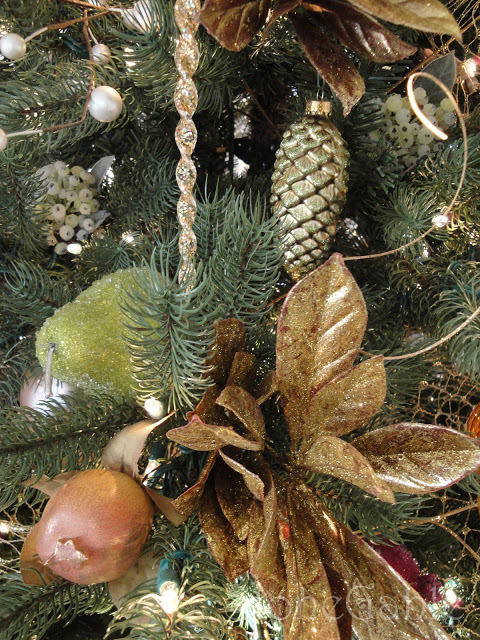 I still kept the same colors, soft yellows, pinks and gold, but added more glitz and that very popular bright green. 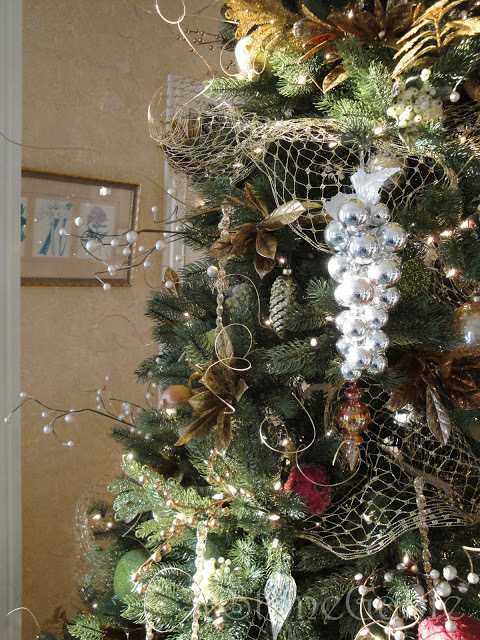 I added bows for the topper and gold mesh garland to wrap the tree in sparkle. I am so blessed to be able to see so much of my family this next week, that this will be my last post until after Christmas. I am very excited to have this precious time to spend with those I love so much. I am very grateful for all the wonderful new blogging friends I have made and the kindness so many people have shown. May the Author of Christmas bless you during this sacred time and in the New Year! Awesome tree!!! How sweet of your husband to suggest you use the tree as your canvas. Merry Christmas. Outstanding & soooooo YOU, Yvonne! 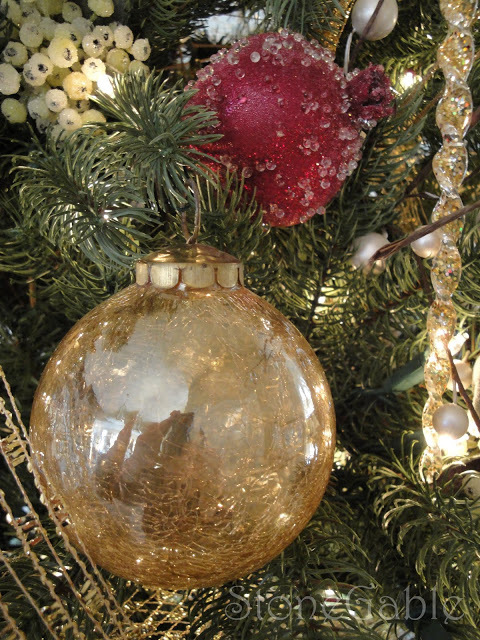 I hope you have a beautiful & blessed Christmas with your loving family surrounding you. 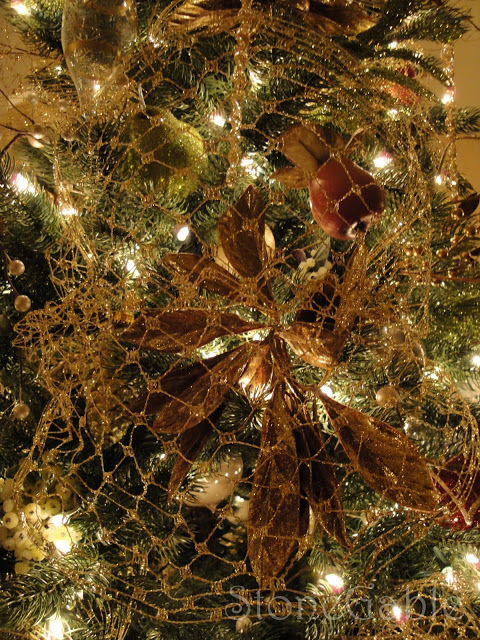 Your family and friends certainly have a beautiful, gracious welcome to your home this holiday! That tree is so pretty with all the sparkles and ribbon. Merry Christmas to you and your family. Gorgeous! 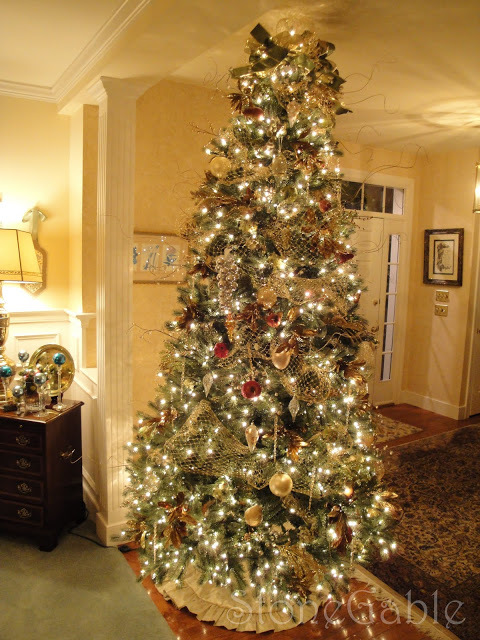 I love a tree in an entry…so welcoming! 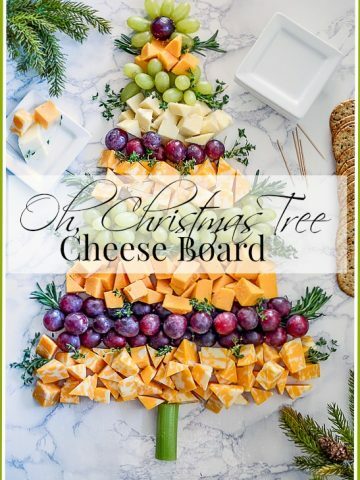 Your tree is absolutely gorgeous!! 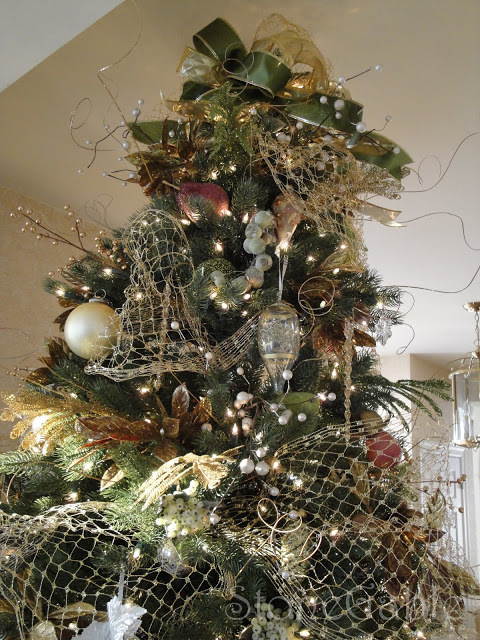 I just love gold trees, mine is gold too! I just wanted to stop by and wish you a happy holiday season to you and your family. I’m so happy to have met you and look forward to seeing you more in 2010! The tree is absolutely beautiful! I love that you have a “grown up” tree. How inspiring, how creative! Blessings to you and your family this beautiful holy Christmas! I love all of the trees.. I used to put that net ribbon on my tree.. I totally forgot about that til seeing this pictures. Great pictures. Merry Christmas to you and yours! I am very grateful to have “found” you here! The tree is gorgeous…and I’m not a bit surprised. You are really very talented. Enjoy your family…my daughter is working so many hours that even though I’m here…I’m not seeing her nearly enough! She is off Wednesday and Thursday, so that will be wonderful. Yvonne, That is an amazing tree! Home sick, but the house is decorated, so my mother-in-law can enjoy it…I’m spending a great deal of time in my bed, but that’s okay..feels cozy. Yvonne, this is a stunning tree. I love the pomegrantes and the acorns. Hi Yvonne! Oh my dear your tree looks like something out of a magazine! Just incredible my friend! I certainly does say Christmas as soon as you step into the door! Merry merry! What a beautiful Christmas tree! 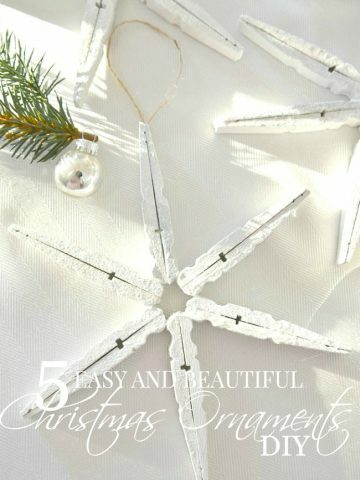 The mesh garland make such a wonderful statement!! Yvonne, it is gorgeous. 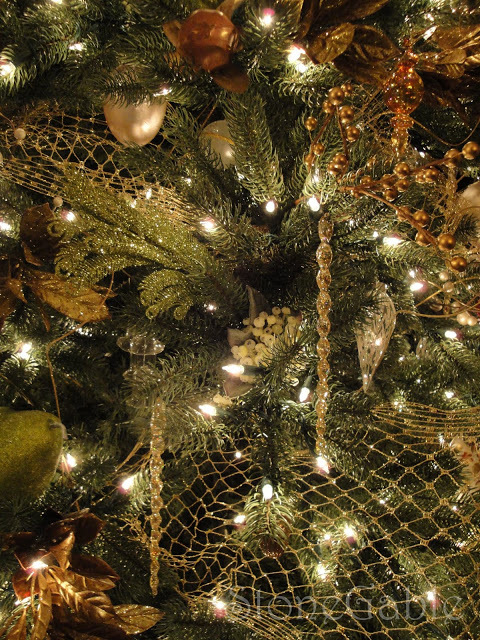 I love the mesh garland. A true work of art. 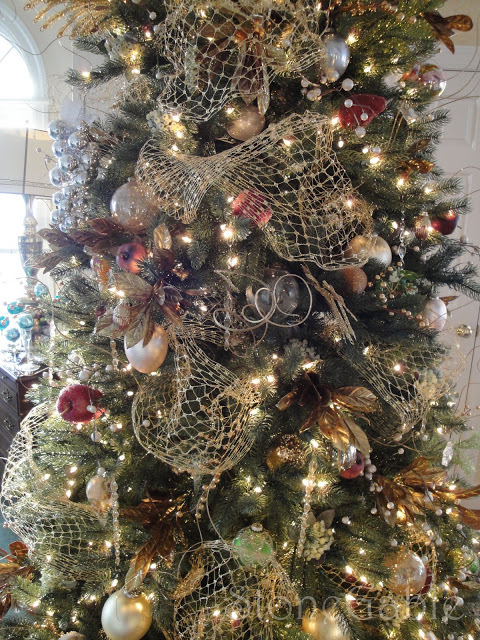 That is one GORGEOUS tree, Yvonne….your home looks lovely and inviting. That truly is a tree to be proud of. It is stunning. Wanna come decorate mine? The kids have been bugging me to let them get trees for their rooms. I think that this year after Christmas I will try to find them small trees they can put in them. 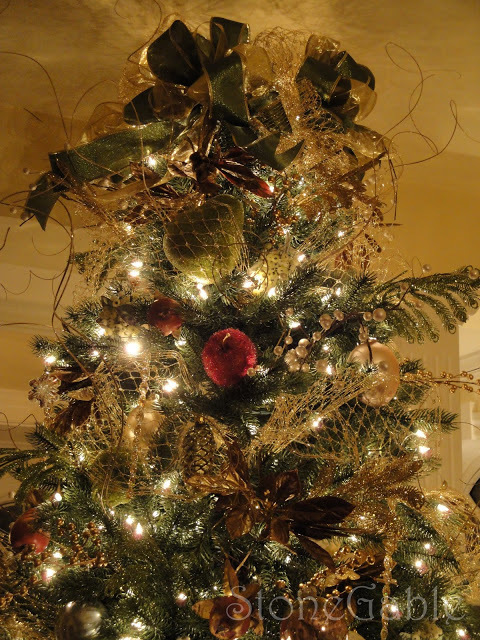 Yvonne…YOUR tree is stunning! 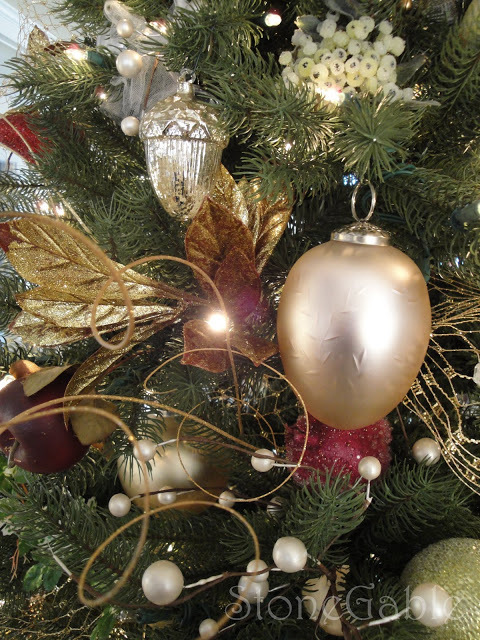 I use those gold squiggly things in my tree too. That tree is just gorgeous! I mean talking about a statement and taking my breath away! I love the colors and the glitz. 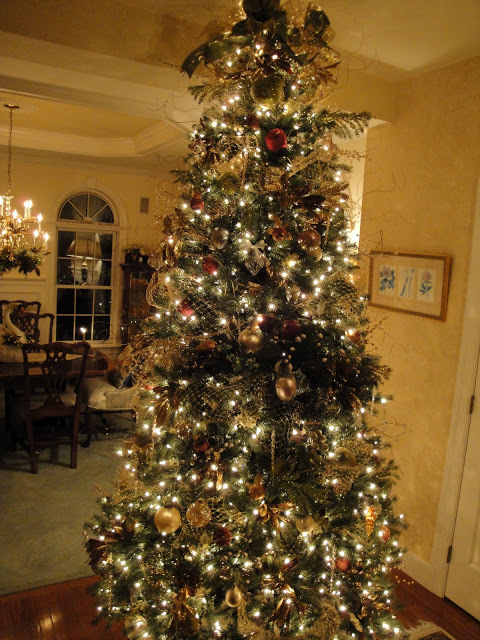 Really pretty….love to have my own tree. 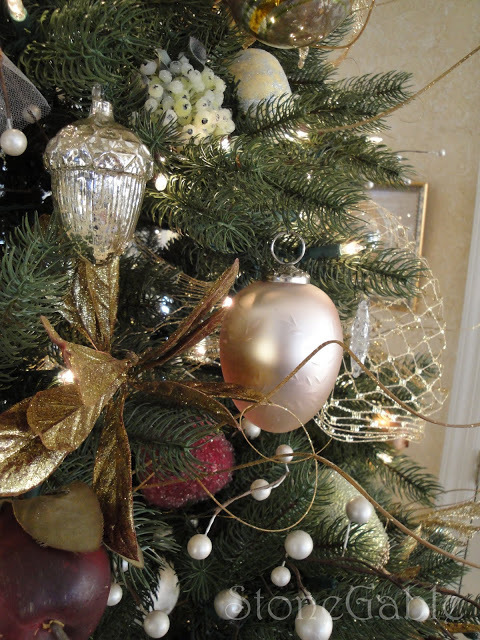 This year I got a small white tree and put it in my pink room and decorated it…so much fun. I will post pics of it tomorrow I think.